Arizona may be a landlocked state, but that doesn’t stop local restaurants from dishing up great seafood. Arizona is home to a variety of restaurants serving up tasty fare that’d make you think the state was coastal. You’ll find everything from oysters to lobsters to fish tacos at these local eateries. Here are the 10 best seafood restaurants in Arizona to get your seafood fix. You don’t need to go to the French Quarter to enjoy New Orleans best seafood. Instead, head to Pappadeaux Seafood Kitchen. This Louisiana-style seafood restaurant serves up Cajun favorites in the heart of Phoenix. They also operate their own distribution system and trucks. This helps Pappadeaux serve some of the freshest seafood in the state. Their Louisiana favorites include gumbo, crawfish broil, lobster bisque, and baked crab mac & cheese. Pappadeaux also has a friendly atmosphere and good happy hour menu to go with their delicious food. The Salt Cellar is quite literally on the underground restaurant scene. You have to travel down three flights of stairs to enter this cellar restaurant. Once you enter, you’ll find an array of seafood from around the world. The Salt Cellar has a rotating menu of food from the Pacific, Atlantic, and Gulf of Mexico. Their lighter fare includes shrimp cocktail, oysters, and crab cakes. A true treat is their shrimp San Remo made with shrimp, artichoke hearts, sun-dried tomatoes, and mushrooms. They also have a large selection of Maine Lobster available year-round. Seafood lovers of all kinds unite at Buck and Rider. This seafood eatery and oyster bar has a large selection of items not usually found on Southwestern menus. You’ll find fresh seafood flown in daily from around the world at their restaurant and raw bar. Their menu includes favorites like sushi, white fish ceviche, ahi tuna burgers, in addition to a new selection of fresh fish every day. This trendy restaurant also has raw bar and drink specials during their famous happy hour. Prescott isn’t exactly a city known for its seafood. But Prescott Lobster & Seafood is putting it on the map. This seafood restaurant features fresh and tasty East Coast lobster from Maine, Connecticut and Nova Scotia. Lobster fans can also get their fix in a variety of ways. Their menu includes lobster mac & cheese, lobster bisque, and lobster rolls. Locals also flock to this restaurant for the Connecticut roll. It’s served with warm lobster meat that is sautéed with green onion and butter served on a toasted New England roll. Kingfisher Bar & Grill doesn’t look like anything special at first glance. It’s housed in a vintage building on a busy Tucson road. Step inside, however, and you’ll be impressed by their selection of quality seafood. Kingfisher’s menu is filled with American seafood favorites like New England clam chowder, grilled sea bass, and shrimp cakes. The crowd favorite is the macadamia nut crusted Hawaiian fish dipped in lemongrass butter sauce. Come in and get hooked at Bluewater Grill. That’s the philosophy at this local chain of a popular Newport Beach restaurant. 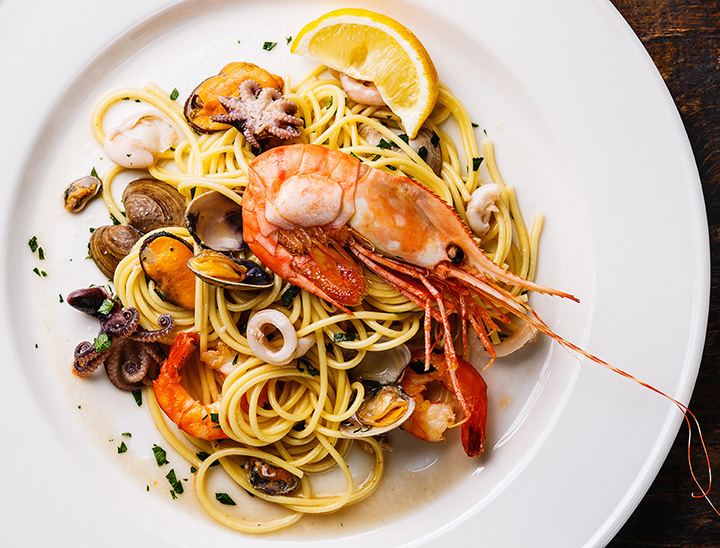 It’s easy to get hooked on their wide-ranging menu of tasty seafood fare. They have a huge selection of oysters, clams and mussels at their oyster bar. They also have over varieties of fresh fish sold on their daily menu. Bluewater also draws a crowd with their legendary clam chowder and daily happy hour. High Tide Seafood Bar & Grill isn’t just about seafood. They also sell high quality burgers, steak, and cocktails. However, this Gilbert restaurant is also known for having some of the best seafood in the Valley. They use steam kettle cooking to make their famed steam pot specials, which include gumbo, tide roast, and seafood pasta. You also won’t want to miss their house favorites including seared ahi tuna, jumbo scallops, and Alaskan king crab. King’s Fish House is a Tempe favorite. Their popular Tempe Marketplace location has a large menu of shellfish, seasonal fish, and sushi. They also have an impressive oyster bar that includes over 2.5 million East and West coast oysters. King’s Fish House also has hefty portions and mouthwatering sides that are sure to leave your stomach full and happy. Hop in the submarine and take a trip to the Pacific Ocean at El Berraco. This seafood restaurant is modeled after a submarine. They also have some inspired Latin seafood dishes including fish tacos and ceviche. One of their most popular dishes is the Mr. Faro made with tuna, scallops, salmon and topped with orange and pineapple sauce. You also won’t want to miss the grilled octopus served with salsa, cilantro and rice.